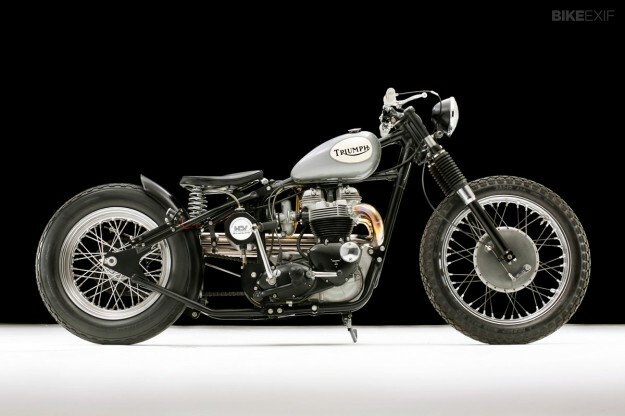 For a workshop you’ve probably never heard of, Halls Custom Vintage is pretty famous. Jake and Rob Hall are the go-to guys for British bike enthusiasts in the States, and they usually have five machines up on their lifts at any one time. Most of these bikes will be restoration jobs, or build-ups for vintage motorsport. 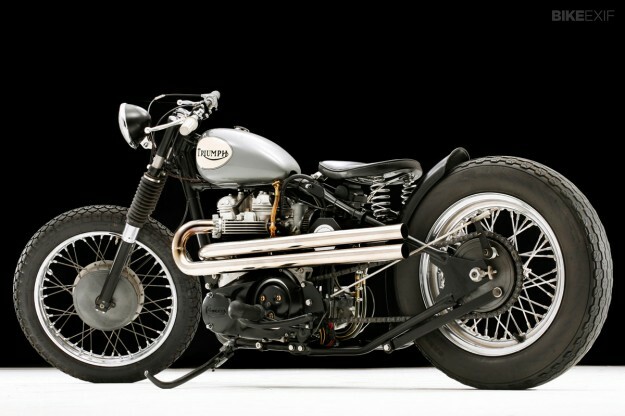 But the Halls also build the occasional custom in their North Carolina shop, like this immaculate old school bobber. It’s a 1970 Triumph TR6 assembled using parts mostly from the 1960s and 70s, with only the electrics giving the game away. Jake could completely rebuild a British motorcycle while still in 9th grade, and the build sheet is instant proof that the Halls know their stuff. The 650cc motor has been blueprinted for high performance and reliability, with new .040 pistons, bearings, a resurfaced cylinder head and a three-angle valve grind job. The carb is an Amal 932 currently jetted for an altitude of 2,200 feet. 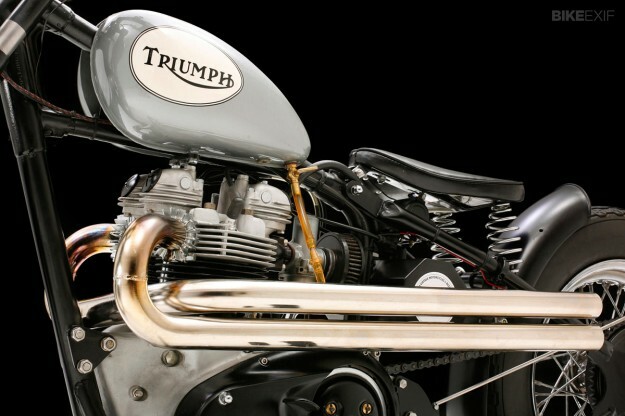 The exhaust system comes from another company renowned for its skill and craftsmanship, Factory Metal Works, and was nickel-plated locally. 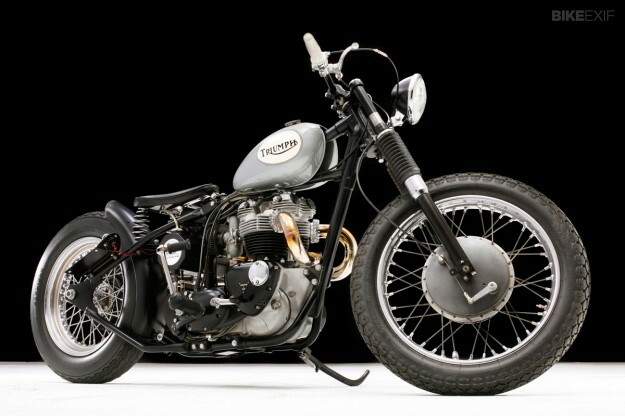 After blasting the front loop of the frame and mating it to a bolt-on hardtail, the whole shebang was powder coated and fitted with a genuine Wassell tank, painted by Glenn Mann in the style of a 1950s T100 flat tracker. Up ahead are solid 7/8 bars hooked up to a TR6c upper triple clamp, with tapered bearings keeping the steering smooth. The stock 19” front wheel is fitted with Dunlop K70 rubber, and out back is a 16” shod with a vintage Carlisle tire. There’s no battery, thanks to a Boyer Power Box and a Pazon ignition system, but the bike starts first kick when warm. 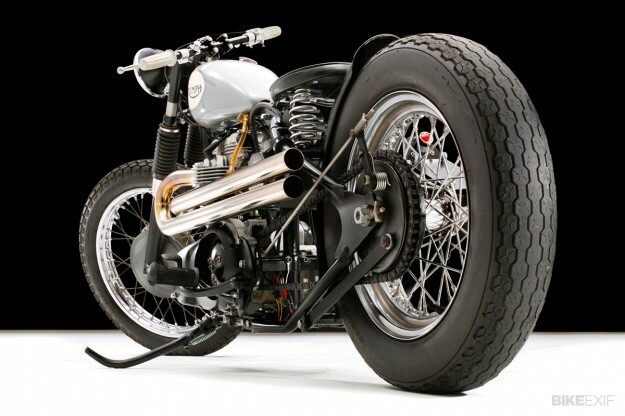 And who wouldn’t want to fire this old school bobber up on a sunny Saturday morning? For more about Jake and Rob Hall, check out this fascinating profile in Capital at Play magazine. Images © Frank Bott. Check out his website and Facebook page for more fine motorcycle photography. To contact HCV, send an email via their own website.